K&M Manufacturing holds nexus in the states of Iowa, Kentucky, Minnesota, North Dakota, South Dakota, Texas, and Wisconsin. We must charge sales tax in these states. Residents of these states must call the K&M Sales Team at 800-201-2358 if you wish to make your purchase tax exempt. A completed “Certificate of Exemption” form is required prior to shipment. To make a status change in your order, the K&M Sales Team must be contacted at 800-201-2358. In some circumstances, yes, special orders can be arranged. However, all special orders are non-cancelable, non-returnable. Please contact the K&M Sales Team at 800-201-2358. The total cost of your order is equal to the price of your items, plus shipping costs, plus sales tax for orders shipped to Iowa, Kentucky, Minnesota, North Dakota, South Dakota, Texas, and Wisconsin. If you are a tax-exempt customer in Iowa, Kentucky, Minnesota, North Dakota, South Dakota, Texas, and Wisconsin, please send us a copy of your state’s exemption certificate. This is needed prior to processing your order. We care about online order security. 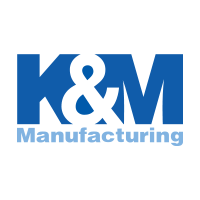 Shopping at K&M Manufacturing is quick, easy and secure. If at any time you feel uncomfortable providing personal information online, please feel free to call our Sales Team at 800-201-2358.